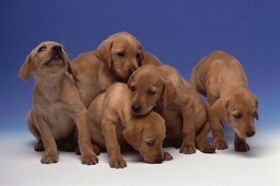 Early separation of puppies from litters significantly boosts risk of adult behavioural problems, so says new research. Could common dog behavioural problems (such as aggression, separation anxiety and other problem canine behaviour) be enhanced as a result of puppies being removed from their littermates too early? According to a new research published online in the Veterinary Record paper the answer is yes. Puppies separated from their litters early are significantly more likely to develop potentially problematic behaviours as adults than puppies who stay with the litter for at least two months. This is important, say the Italian authors, because behavioural problems affect relationships with owners and the risk of subsequent abandonment. The authors base their findings on 140 adult dogs, half of whom had been taken from the litter and adopted between the ages of 30 and 40 days, and half of whom had been taken from the litter at 60 days. The dogs’ owners, who were clients of several veterinary practices in Naples, Italy, were all asked to complete a telephone questionnaire about their pets, including their provenance, breed, and a range of potentially problematic behaviours. These included destructiveness, excessive barking, possessiveness around food and/or toys, attention seeking, aggressiveness, play biting, fearfulness on walks, and reactivity to noises. The dogs were aged 18 months to seven years at the time of the study. Half had come from a pet shop, while one in three came from a friend or relative, and the remainder were sourced from a breeder. None of the dogs had been in a shelter or been obviously traumatised. Attention seeking and reactivity to noises were the most commonly reported behaviours. And younger dogs (under 36 months) were significantly more likely to be destructive and to tail chase than older animals. But with the exception of pica eating, aggression towards the owner, paw licking and shadow staring, all behaviours were significantly more likely among dogs who had been separated from their litters before 60 days, irrespective of their breed, neuter status and size. Similarly, some behaviours were more common among pet shop dogs who had been taken early from their litters than among pet shop dogs taken from their litters at 60 days. “It is generally accepted that dogs go through a sensitive period, the socialisation period, during which social experiences and stimuli have a greater effect on the development of their temperament and behaviour than if they occur in later life,” write the authors. And the evidence increasingly points to a mix of early genetic, environmental and experiential factors that may permanently reconfigure the DNA, so leaving lasting effects, they say. “Early separation from the dam and littermates, especially when combined with housing in a pet shop might affect the capacity of a puppy to adapt to new environmental conditions and social relationships later in life,” they continue. “Behavioural intervention can address the development of problem behaviours and improve the dog’s relationship with the owners, ultimately reducing the number of dogs that are relinquished or abandoned,” they conclude.